With potentially record El Nino generated rains approaching the region this week, we decided to head out today and see the desert before we are stuck indoors for the week. They are predicting as much as 3-5 inches of rain from Monday to Saturday in the Phoenix area. If 5" does fall this week, it would set an all-time one week record for the area set way back in 1911! The Sonoran Desert is under a "Severe" drought level currently. They recieved less than half the normal rainfall in 2009 and basically nothing more than a trace so far this winter. The plants are as brown and shriveled as we have ever seen them here. People were predicting a non-existant wildflower season. Now, with these massive storms approaching, it could be a very interesting thing to observe. Just how quickly will the desert come alive? How quickly will the leaves sprout from the Ocotillo? How quickly will the seeds in the soil sprout and the ground be covered with a carpet of green? Will it save the wildflower season? Some say its too late for the annuals, but I am sure the woody plants will flourish. I'll definitely keep everyone up to date with photos and descriptions in the coming weeks. 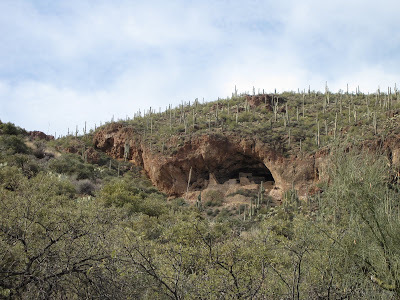 So, knowing we'll be trailer bound this week (with frequent trips to the library expected to give Hilina some activities to do), we decided to follow up our trip to the Salado ruins in Globe yesterday to visit the Salado cliff dwellings of Tonto National Monumnet today. 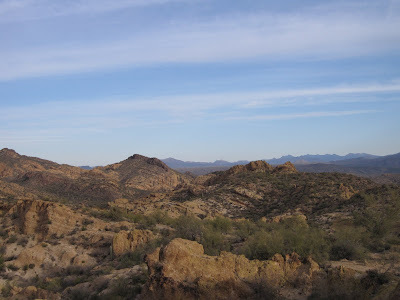 To get there, we drove up the Apache Trail from Apache Junction, past the Superstition Mountains, and into some of the most rugged country around. 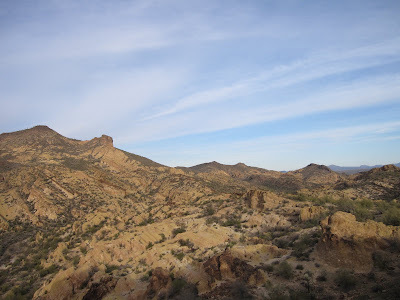 The Apache Trail is an official state highway, but that is hard to tell with its narrow winding roads that halfway across turn into dirt. It travels 42 miles from Apache Junction to Lake Roosevelt (which is the flooded Tonto Basin where the Salt River meets Tonto Creek). We've done this road on three occassions previously. It is alway great as a reminder of this rugged land. Plus, Hilina loved her prickly pear cactus ice cream we got in Tortilla Flat. 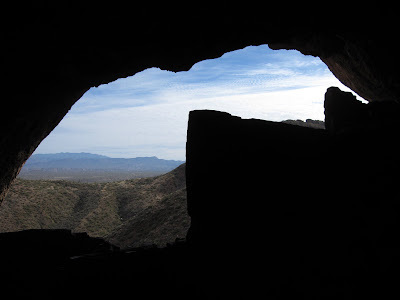 Above the Tonto Basin are the cliff dwellings of Tonto National Monument. 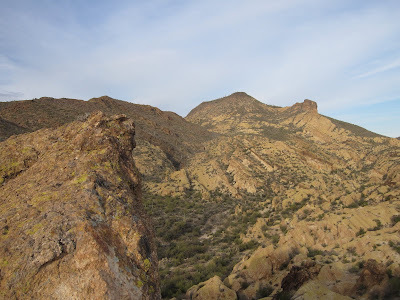 It is a steep 1/2 mile trail to the ruins from the visitor center, with some amazing and expansive views. The visitor center itself is quite small, but it has a nice 18-minute film and some nice exhibits. 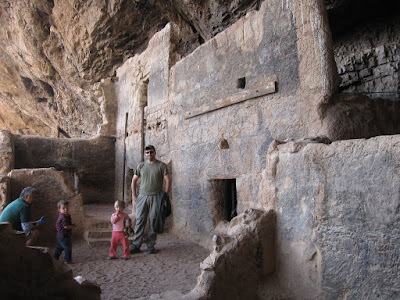 There is also an "upper dwellings" area that can only be visited from April to November on a guided tour. We arrived too late to meet that tour. Perhaps we'll try it another day.